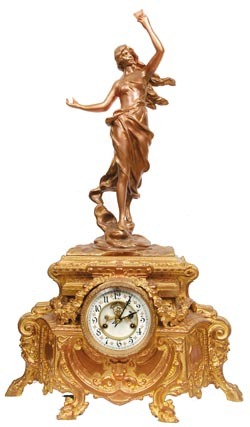 Waterbury Clock Co., figure clock, "Duchess", ca 1905. Cast metal case with gold gilt, base retaining 90 percent of the gilt, statue much less, maybe half. Where it is getting down to the copper undercoat it looks more bronze. If handled a few more years it will need new gilt. This piece is 28" high, statues were interchangeable between bases, all held in place by 2 pegs in holes. You could write a book about the various items cast in the metal. The front 2 feet are sea serpents, back two are rams feet. Just above the rams feet is a profile of a god. There is a rope of flowers over the bezel, and numerous other unnamed objects. Two piece porcelain dial, open escape, heavy beveled glass, and Rocco cast gilt sash and bezel, all very nice. This is a lot of clock for this minimum. If it were Ansonia it could bring over $2000. You best be buying Waterbury before they start increasing in price. Ly-Waterbury No. 1245.